Your child begins to throw tantrums. Congratulations! You have successfully unlocked a bigger challenge in your parenthood and you’re now beginning to get overwhelmed. How to deal with tantrums can be tougher than you think. Frustrations will absolutely come along your way but don’t make them a hindrance for you to succeed on dealing with your child’s tantrum. Temper tantrum is the sudden rise of a child’s emotion. It is an unplanned presentation of anger or other emotions by a child displayed by crying, screaming, swinging of arms or legs or even rolling around the floor. When your child is having a meltdown, it is certainly not because of nothing. However, the reasons do not necessarily mean that children try to be manipulative or just to seek everyone’s attention. Your toddler aged 2 to 3 years old just simply can’t express to words what she is actually feeling. Even when she knows a lot of words at her age, she is still not able to formulate a sentence that can explain how she feels. That’s why, if she doesn’t get what she wants and gets upset by it, she just screams and throw a tantrum. Being tickled by curiosity and desire to discover things on her own, your little one always wants to do more than she can handle. Conversely, she is physically incapable yet to do all these things so she becomes frustrated. Young children are also easy to get overwhelmed. This means a slight change in the child’s routine affects her behaviour. Delayed gratification doesn’t work for kids. They don’t understand but they are all about getting what they want now and not later. Kids can be only self-centered for a while. 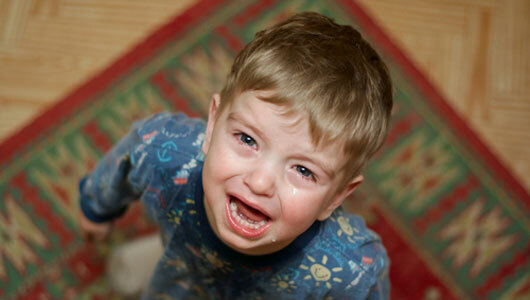 Do all children throw tantrums? Basically, yes. It is a phase in everyone’s childhood we can’t possibly skip. Nevertheless, it can only be measured with severity; some are mild and some are extreme. Your child may be too young but you have to believe that she will soon understand. Explanations are a good way of teaching your child to avoid her tantrums especially when right words are used. Talk about the things that make her down or angry. Try to compromise. Words are powerful. Too many restrictions deprive your child from the independence she aims and wants. Using the word no more than enough can make your child’s tantrum worse or frequent. Try to limit saying no and be sure that when you say it, there’s a clear explanation behind it. Losing your temper can only mean you are going to hurt your child. Whether physically or emotionally hurting her, once you lose your temper, everything else will mess up. Instead of keeping the situation high, you must be the one to show your child that you are there to understand and to make things okay. Now is your best time to act silly. Children tend to laugh even when they feel upset. Remember, laughter is still the best cure! Try to redirect her attention to something else. It could be a toy or a show in the television. Once it catches her attention, she will soon calm down. When she realizes that she can’t draw your attention any longer, she will stop and think why. This will make her curious and cool her down. Afterwards, you can get back to talking to her about the situation she’s frustrated about. If all else fails, just try to remove yourself from the scene. Your child will begin to get notice that what she did is wrong and you didn’t like it.